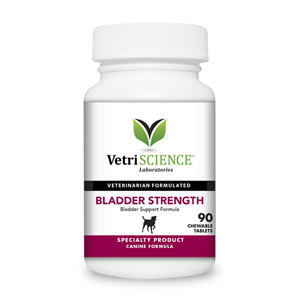 Bladder Strength for Dogs supports bladder control and bladder health and is recommended for senior dogs and spayed or neutered dogs with urinary incontinence or leakage. 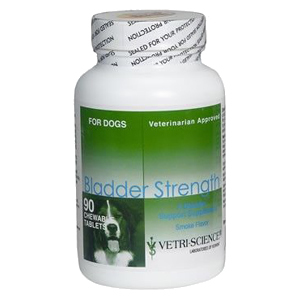 Bladder Strength helps to maintain a healthy bladder in dogs. Urinary incontinence can be caused by a variety of factors, including hormonal imbalance, a weak bladder sphincter, and urinary tract infections. Leaking of urine is fairly common in senior dogs and dogs that have been spayed or neutered. Pumpkin Seed Powder has a cleansing action and supports bladder emptying. Rehmannia is a Chinese herb that supports kidney function. Each bottle contains 90 chewable tablets. Smoke flavored. For dogs only. I've been using this tablet for my Dalmatian for over a year now with great success. She developed a leakage around 4 years of age, sometimes there would be a small wet spot where she was lying. This product was exactly what was needed...no leaks! My dog is still on her first bottle. Occasionally still has a little drop of blood in her urine. I think she's better than she was, but she still has a way to go. 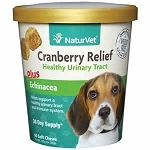 Pumpkin Seed Powder has been shown to improve bladder function in animals. It is beneficial to urinary tract health due to its cleansing action. 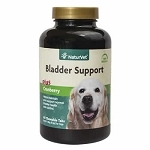 It also strengthens bladder muscle and supports bladder emptying. Rehmannia is a Chinese herb traditionally used as a blood tonic and to support renal function and healthy levels of estradiol in females and testosterone in males. Wild yam provides phytoestrogens. Phytoestrogens help maintain normal bladder muscle tone that is lost after spaying or due to aging because of lower estrogen levels. Soy protein contains isoflavones to support estrogen production in spayed females. Saw Palmetto helps support normal bladder control and muscle tone. Olive leaf supports healthy microflora in the GI tract. Vitamin B6 - 25 mg.
Inactive Ingredients: Brewers yeast, Microcrystalline Cellulose, Silicon Dioxide, smoke flavor, Stearic Acid and Vegetable Stearate.